For the second day in a row, the Legislature was embroiled in debate over a merger between the state’s two largest utilities. The Senate has already voted to require that ratepayers get money back when Central Vermont Public Service Corporation is sold. The debate in the House centered on whether the Legislature should get involved in a case now before the Public Service Board. The board is considering a merger between Central Vermont Public Service Corporation and Green Mountain Power, now owned by GazMetro in Montreal. East Montpelier Democrat Tony Klein said lawmakers would set a dangerous precedent if they mandated that money be returned to ratepayers. "I know we’re trying to accomplish something. But this is a precedent that I think is serious," Klein said. "It’s a de-stabilization of a regulatory process that has been in place for 52 years. And I don’t think that that’s worth that." But Barre Town Republican Tom Koch said sometimes the Legislature has to intervene to protect the public. Koch criticized the agreement reached between the state and the utilities. That deal allows the merged utility to invest the ratepayer refund money into weatherization and efficiency programs. Under the agreement reached with the Shumlin Administration, the utility can then recover the refund money in its electric rates. Koch said the deal violated an earlier PSB order that says ratepayers should share in the profits if the company was healthy enough to be sold. "I find it distressing, because in the Vermont that I know a deal is a deal," Koch said. "You can fancy it up with lawyer language all you want. And you can say it’s complicated. But it ain’t. And the people out on the street know what’s right and what’s wrong." But when the votes were counted, the Democratically controlled House decided not to mandate that the refund money be returned. The amendment was rejected by a vote of 87 to 54. The House then approved an amendment sponsored by Jamaica Republican Oliver Olsen. Olsen said his proposal prevents the utility from collecting the weatherization investment back in rates. "My hope with this amendment is that we can address with one piece the most egregious example of the MOU that we’ve all been talking about, which is not only will customers not get their money back directly, but they’ll actually going to be required to pay again for the benefit of not getting their money back," Olsen said. 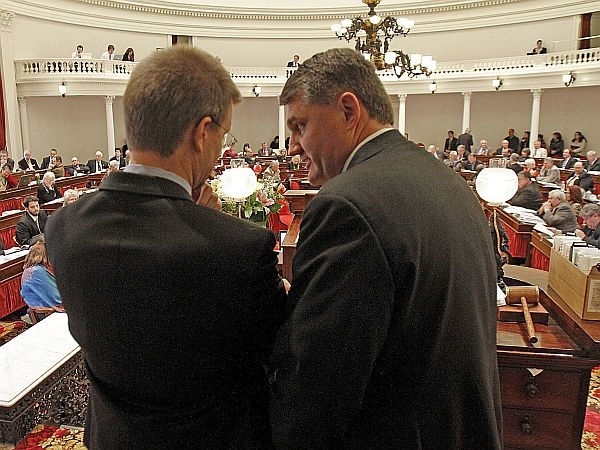 Olsen’s amendment didn’t placate the most ardent opponents of the merger deal. And Burlington Republican Kurt Wright pointed out that the House will have to deal with the issue again next week. That’s because the Senate voted overwhelmingly to add its refund mandate amendment to the must-pass budget bill. "The proposed merger is unlike any we have seen before we have seen in Vermont," Wright said. "Is this mega-deal the right time to step in and protect ratepayers? It’s a difficult vote, but I vote yes. And 27 members of the Senate ensured yesterday that this issue is not going away." The budget bill with the Senate amendment is now in a conference committee.